Elysion (エリュシオン, Elysion?) 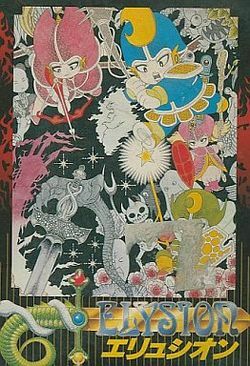 is an action-oriented RPG originally developed by System Soft for the NEC PC-9801 line of Japanese home computers and published in 1986. Tokyo Shoseki then converted the game for play on the Famicom, and published it in 1988. The game was only released in Japan, but an English patch has been released for the Famicom version, which can be found here. At the start of the game, you must choose from one of four races. Each race has different statistics which gives them different degrees of physical and magical power. After you make your selection, you begin the game in a castle on the west portion of a diamond shaped continent. Throughout the continent are caves which lead to different regions of the world. Your goal is to collect a number of scrolls that reveal the method of defeating a great evil that is menacing the world. Along the way, you'll have to explore different places in order to find items required for your quest, and powerful items that enable you to defeat stronger enemies along the way. This page was last edited on 8 December 2012, at 07:17. This page has been accessed 5,449 times.